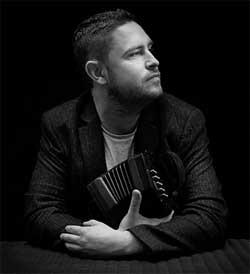 Jack Talty, from Lissycasey in County Clare, is a traditional musician, composer, producer, and educator. Jack has collaborated with many musicians on over 40 albums. These include Martin Hayes, Frankie Gavin, Tommy Peoples, Finbarr Dwyer, Noel Hill and many more, too numerous to mention. With fellow concertina player, Cormac Begley he released "Na Fir Bolg" on his own Raelach recording label in 2011. In the same year he teamed up with Neil O'Loghlen (double bass, flute and tin whistle) to form the seven member group "Ensemble Ériu". The group released it's first album, "Ensemble Ériu", in 2013 and their second, "Imbas", in 2016. Also in 2016 Jack released a solo album, "In Flow" on his Raelach label. Jack teaches at many of the summer schools in Ireland including the Willie Clancy Summer School in Miltown Malbay, the South Sligo Summer School in Tubbercurry and regularly at the University of Limerick. Check out the Jack Talty website for more information on Jack and Ensemble Ériu.